If you’re a federal candidate, a c4 nonprofit, or a state-level candidate that did not have to set up a merchant account, you’ll receive a check each week containing funds from the previous week. We cut and mail checks every Monday, containing funds through Sunday at midnight. If you’re a local candidate or state-level candidate that had to set up a merchant account, the money will be deposited directly into your bank account. How can I request a check/get my money faster? If you receive checks from us, just give us a call. We can cut and mail you a check any day of the week containing funds raised through midnight of the day before. If you’re working on a large campaign or organization that’s raising over $5,000 every week, we may be able to offer you wire transfers. Just contact our customer service team at support@actblue.com or give us a call at 617-517-7600. If you have a merchant account, we're already getting your funds to you as fast as possible. Because we act as a conduit, we process hundreds of thousands of dollars on a daily basis. We leverage the amount of money that we move to get fast processing times and great rates from our bank. I just received an ActBlue check and I don’t know who contributed, what should I do? 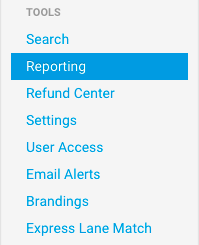 You should log in to your ActBlue account and visit the Reporting tab in the left menu of your Dashboard. There you’ll find instructions on how to handle all of your donor information. You can download your data to integrate into NGP, download it in a CSV, and see details of individual weekly checks. If you have questions about how to access your donor information, please let us know. If the donation is still in the “Undisbursed contributions” section of your Reporting tab, then you can certainly refund the donation. Go to the Contributions Search tab in the gray menu on the left side of your screen and type in the first and last name of the donor. Then select the date the donation was made. Once you find the donation, click on the date and it will take you to the next page where you can process the refund. For your records, please choose the most accurate reason for the refund. Please note that these search fields are case sensitive. Further, if you have trouble finding the donation we recommend making sure there isn’t a space at the end of the last character. If you are using a merchant account, you can issue refunds even after the contribution has been disbursed. For more information, visit our section on Merchant Accounts. If the donation was already disbursed via check, we can issue a refund for you as long as there are pending funds in your account. 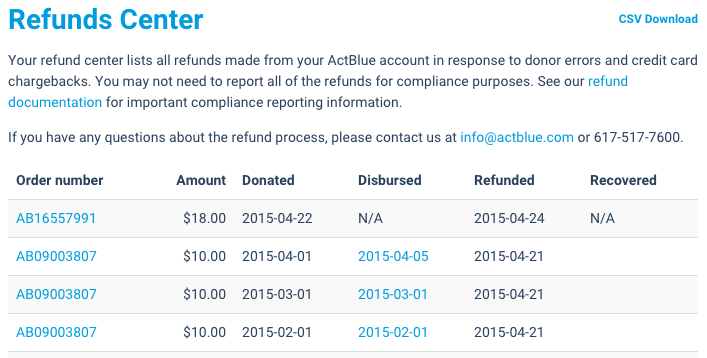 For a refund, send us an email at support@actblue.com or give us a call at (617) 517-7600. All we need is the donor’s information and we’re happy to take care of it for you! Once a donation is refunded, can I still access the compliance information? Once a donation is refunded, it will be listed in the Refunds tab of your dashboard. If you click on the order number on the left hand side, you will be able to view the original donation. In the refunds center, you will also see the date of the refund and the date that the donation was originally disbursed. I see a deficit disbursement on my Dashboard, what is that? Please contact us if you have questions about accessing or reporting deficit disbursement data.